The DG NIMASA, Dr. Dakuku Peterside, some Management Staff of the Agency and foreign instructors in a group photograph with the grandaunts in Lagos during the graduation ceremony of the special integrate course maritime surveillance and security in Lagos, February 6, 2019. 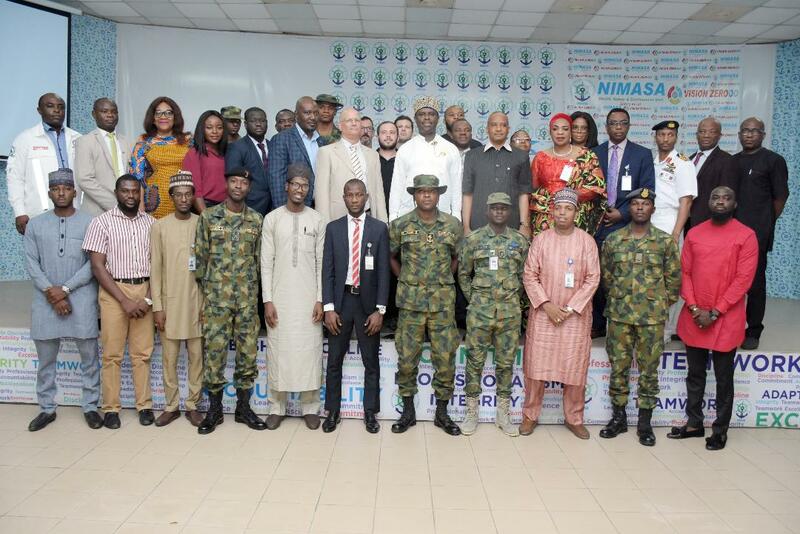 In its effort to rid the Nigerian maritime domain of criminalities, the Federal Government through the Nigerian Maritime Administration and Safety Agency (NIMASA) has undertaken surveillance training for officers from the Nigerian Army, Nigerian Navy, Nigerian Air Force, Nigeria Police, the Department of State Services (DSS), and NIMASA, on the C4I Integrated Surveillance Systems operation. The system will aid the coordinated view of the entire Nigerian maritime domain. Speaking yesterday at the graduation ceremony held at the Nigerian Maritime Resource Development Centre (NMRDC), Lagos, Director General of the Agency, Dr. Dakuku Peterside, restated the government’s determination to ensure that the country's territorial waters was free of piracy and all forms of maritime crime in order to facilitate economic development.